Edita immigrated to Canada as a young woman from Bratislava, Slovakia. It was a challenging time for an 18 year old when she, along with her mother & siblings, joined her father in Vancouver. Determined to “fit into” a new culture, she improved her English language skills and eventually secured a position at the main library at the University of British Columbia. She’s worked at UBC, with a brief interruption, ever since! Her mother taught her to knit at a very young age, but she says that she was a “knitting klutz”! She knit on and off during her youth & resumed again in more earnest when she came to Canada. 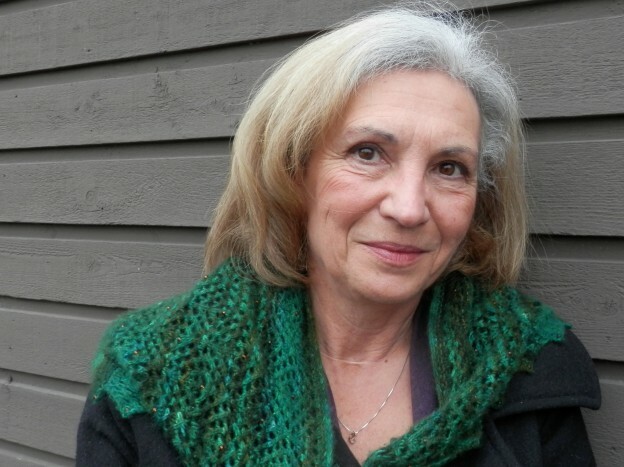 Edita says that knitting has always been her strength when she is stressed or feels challenged and in the first years in Vancouver, the knitting needles provided a “sense of normalcy”. Edita is a past president of the WCKG. She’s also been the Guild’s secretary and vice president and feels that being part of the executive has been very fulfilling as well as challenging. When she doesn’t have needles in hand, her passions include golf (where she captains her team), reading & being a new grandmother! She teaches “beyond beginner” knitting classes at LYS, Wool & Wicker twice weekly and has studied under fellow WCKG member Jean Wong. Edita also enjoys being part of the UBC library annual afghan project. Knitters are recruited among the staff members and the completed afghan is auctioned (proceeds going to Covenant House) at their Christmas luncheon. Edita uses Ravelry, as well as favourite knitting magazines such as Vogue Knitting & Interweave Knits for inspiration. These days projects such as socks & hats that can be quickly finished are on the needles, but her most satisfying project was one she completed several years ago. Wanting to knit an Aran sweater, Edita navigated her way through an English pattern soon after she arrived in Canada. It gave her a wonderful sense of pride and accomplishment and she remembers that sweater very fondly. A sweater intended for her husband has been sitting in a basket, waiting for the neckband for 3 years! A complicated Gansey (fisherman’s knit) design from Vogue knitting, she has lost all interest in completing it. Maybe someday? Edita loves to knit on small needles with lace weight yarns. She finds the beauty of lace patterns fun to knit, especially in mauves and greens. The colour combinations of Noro yarns are a particular favourite. She would love to knit one of Lucy Neatby’s double knitted afghans or something from designer Kaffe Fassett. A member since 2005, Edita joined after she received a brochure from fellow WCKG member, Y, while shopping at Wool & Wicker. After attending her first meeting, she knew she was “home”. She feels that the Guild has helped to widen her circle of friends and has provided her with inspiration. She says she always has felt a sense of community within the Guild and has enjoyed time spent on the WCKG executive. “Knitting is life. It combines creative, artistic, colourful challenges. You do math. You do it with your hands. I’m amazed that 2 needles and a piece of yarn combine to make something. It’s fascinating!”. This entry was posted in member profile on March 1, 2014 by Marlene P..